Ronnie Harris of Go Bronzeville speaks to NACTO WalkShop participants. This past week, Chicago became ground zero for planning professionals looking to build solutions to city transportation challenges. The annual National Association of City Transportation Officials conference provided an opportunity for experts in transportation, engineering, and community development to network and share resources. The conference was also filled with a variety of chances to get out and see transportation infrastructure in action. Take the Bronzeville Flourishing — Rooted and Linked WalkShop, for example. 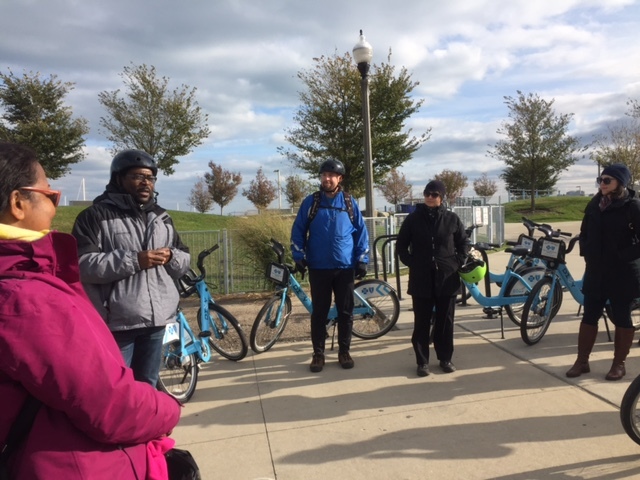 A group of conference participants took transit to the Bronzeville neighborhood, where they were met with a truckload of Divvy bike share bikes ready for use. The guided tour led participants over a new pedestrian bridge, through recently-created bike lanes, and down a busy commercial corridor in the heart of the community. Amanda Woodall and Tanera Adams of Chicago Department of Transportation led the way, alongside Ronnie Harris of community-based organization Go Bronzeville. Another WalkShop, The 606: Turning One Transportation Solution into Another, examined challenging questions of development and displacement in the context of a railroad track that was recently converted to an elevated pedestrian and bicycling path. This tour was facilitated by Caroline O’Boyle of the Trust for Public Land. The WalkShops did some of the important work of turning theoretical planning and design questions into real-life scenarios. 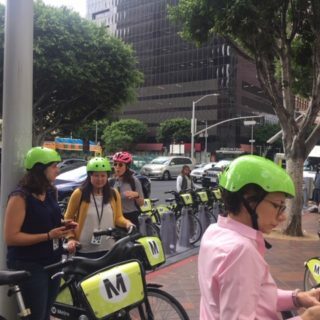 In addition, they showed the importance of strong community relationships and involvement in the planning process, something bike share professionals are working through every day. Bike share had a presence in more than just the physical aspects of the conference. 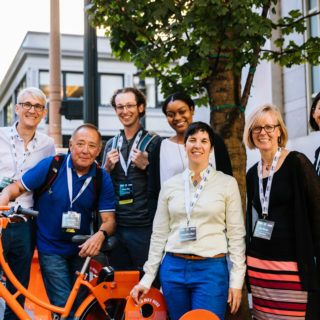 Several panels discussed work by cities, community-based groups, and researchers to identify and address barriers to using bike share, especially among low-income communities and communities of color. Key bike share participants represented a wide variety of cities, including Chicago, New York, Portland, Atlanta, Detroit, Seattle, and Los Angeles. 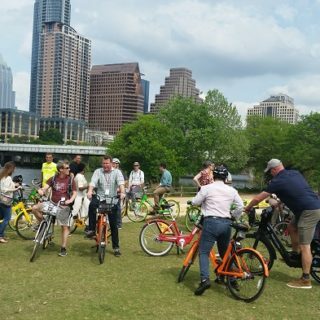 The conference was followed by a discussion on right-of-way best practices for dockless bike sharing systems, hosted by the North American Bikeshare Association. The conversation showed both the promise and potential pitfalls of such systems. Video from the conversation is available here.